This and other photos show the lunar rover with no tracks leading up to the tires. This proves the rover was simply dropped or lifted into place as a prop. This is a famous photo of the repair performed on the right rear fender of Apollo 17's lunar rover. It was taken by commander Gene Cernan at the end of the activities at Geology Station 2 during EVA 2, shortly before the astronauts drove off for the next station. His partner Jack Schmitt was already seated in the rover. At right is a photo of the rover at the same location taken from a greater distance. The dark areas around the rover indicate where Cernan and Schmitt have walked, preparing the rover for the stay and assembling the equipment they would use to gather specimens. The EVA video and transcript from this point in the mission show the astronauts working at the rear and sides of the rover, preparing for the scheduled activities at this station. They dusted the television camera lens, assembled sampling equipment, cleaned some equipment, covered the batteries, and took some gravimetric readings. In the photo above you can clearly see their footprints all over where the rover tracks should be. Keeping in mind that dust flies great distances when the astronauts shuffle about, it is reasonable to believe that the tracks have simply been obliterated by the astronauts' feet during the hour of activity at Station 2. 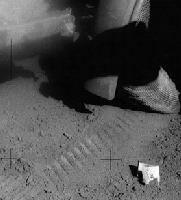 In the full version of the long-distance photo available from the Apollo Lunar Surface Journal the rover tracks can be seen faintly on the right side of the image. Part of the problem with the conspiracist reasoning is the expectation that rover tracks ought always to be prominently visible. Even when there is no plausible reason for them being erased by subsequent activity, the tracks are simply not as visible to start with as people expect. Here, for example, the astronauts are high up the slope of a mountain. It is reasonable to expect the dust to be thinner there than in the valley floor near the landing site, or on the plains where Apollo 11 landed. Thinner dust means the tires don't penetrate as far, leaving shallower tracks that aren't visible from a distance. Below are some examples of shallow (but still visible) rover tracks. The conspiracists argue that the rover may have been lifted into place as a prop. They may be half right. In lunar gravity the rover is not especially heavy. An astronaut can lift one end of it with little difficulty. And since the rover's turn radius, like that of any four-wheeled vehicle, is limited, the astronauts sometimes found it easier to lift one end of the rover and turn it so it pointed in the direction they wanted to go, rather than maneuvering through a three-point turn. When this occurred, there would obviously be no track leading up to the wheels.